Walchem controllers are designed to control your chemical programs for pools and spas. Accurate readings of the chlorine level in water. Accurate reading of pH and temperature, and optionally, the conductivity PPM levels for the TDS or the salt concentration in the water for the salt systems. Different controllers are available to control the various chemical products; liquid chlorine, pellets or salt system. 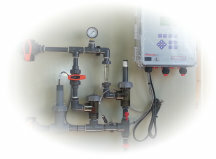 For the PH control output, you have the choice of the metering pump or CO2 valve. Some models can be connected to the Internet and send remote alarms, data acquisition files. You can connect online directly on your controller like you were there. V-Touch integrates these centralized controllers on their platform. Everything becomes easier and gives you unparalleled performance. Our customers have the most accurate and durable installations, we can reduce the cost of chemical programs through precise control of Walchem pH, PPM and conductivity sensors. We can send text messages or emails if the parameters are outside the required limits. We can save the water quality data and obtain specific documents to confirm that your facilities are within the standards set by the various government regulations. We manufacture several standard systems for our/your customers. These systems are only available through our authorized resellers or exclusive clientele in Quebec and are offered to everyone outside of Quebec (Canada). Our complete systems are targeted for any customers with an offer from a competitor product other than Walchem and Iwaki products. Premium quality systems at affordable prices to suit your budget and preferences. Complete system – pH and ORP reading or PPM + metering pump control or salt system + remote access with acknowledgment of alarms if the controller is online, V-Touch. – Advance system – pH reading, PPM reading, + conductivity reading, metering pump control or CO2 or salt system + remote access with acknowledgment of alarms if the controller is online, V-Touch.